Pigs are large omnivorous mammals with powerful bodies and coarse hairy coats. Their thick necks, wedge-shaped heads and mobile snouts are used in feeding to uproot the ground and find prey or plant material. Feral pigs are easily distinguished from domestic pigs via a smaller leaner and more muscular stature, shorter hind quarters, longer snouts and tusks. Older boars usually develop a thick keratinous shield over their shoulders, which provides some protection during fights with other boars. Feral pig hair is longer and coarser than a domestic pigs and sometimes forms in a tuft along their back (hence, the name razorback). The tails of feral pigs are not curly as in domestic pigs, they are instead long and straight with a bushy tip. Ecological characteristics of feral pig activity, group size and home range size should be considered in any management strategy aimed to control pig numbers or reduce their negative impact. Feral pig activity varies between different habitats and climates. High activity has been reported to occur in early morning and late afternoon in tropical climates (Diong 1982). However, in India pigs have been reported to feed nocturnally to raid croplands (Sekhar 1998, in Wolf and Conover 2003). On Santa Cruz Island (California) the milder weather of fall and late winter causes pigs to be more active in the morning and evening, while the short cool and often rainy days of winter causes midday activity. Pigs on the island were active at night mostly when conditions were warm and dry (Van Vuren 1984, in Wolf and Conover 2003). In terms of group structure, in North-western Australia mob sizes are generally about 12 or less, although occasionally mobs of 30 pigs are seen. Adult boars are mostly solitary.. In South Carolina the average home range of boars is 226 hectares, while the average for sows is 181 hectares (Wood and Brenneman 1980, in Wolf and Conover 2003).Whereas in Austrailia average home range can vary from 140 hectares for a boar in Namagdi National park , Australian capital territory (McIlroy and Saillard 1989), to 430 hectares for a boar in Western New South Wale (Giles 1980). Feral pigs are polyoestrous, adult sows have a 21 day oestrous cycle and a gestation period of 112-114 days (Choquenot et al.1996). Estimated litter size is 4.5-6.3 viable young per sow (Twigg et al. 2005, Choquenot et al. 1996) but in good conditions 10 piglets can be born to one sow. Pigs are normally social animals but adult boars over 18 months old are invariably solitary (McIlroy 1990). In many highland areas of New Guinea pigs are deliberately placed into gardens at the end of a harvest sequence and prior to gardening to remove remaining sweet potato tubers and to assist in turning and aerating the soil before replanting (Westermann 1968, Paglau 1982, Wood and Humphreys 1982, Tucker 1986, Kohun in hide 2003). High densities of pigs may also be attributed to water availability. The recent expansion in feral pig distribution in Australia has been attributed to the increase in suitable habitats, in particular, an increase in water availability from farm dams and developing forest industries (Spencer and Hampton 2005). Feral pigs are polyoestrus: adult females have a 21-day oestrus cycle and a gestation period of about 112-114 days. In New Zealand they probably breed throughout the year, though mainly in spring and summer (Wodzicki 1950; J. McIlroy unpublished). Their litter size is usually between 6 and 10 piglets, but usually only half this number survives. They reach breeding age at between 10 and 12 months (Wodzicki 1950). In one study females were found to have about 5 young every 0.86 years with some females having two litters per year. In this study fertility continued to increase with age until it peaked at two to three years of age. 58% of piglets died before weaning (Baber and Coblentz 1986, in Wolf and Conover 2003). Pigs lack the multiple stomachs found in ruminants such as cattle and goats. Feral pigs are omnivores with an opportunistic diet, including high-fibre (> 25%) low-protein grasses, legumes, herbs and roots. They readily feed on crops, fallen fruits, seeds and small animals (McIlroy 1990). Pigs regularly root the ground in search of roots, fungus, nuts, seeds and grubs (Frederick 1998, Sicuro 2002, in Wolf and Conover 2003). In their native Mediterranean woodland the wild boar compensates for the reduced supply of acorns in the spring by raiding underground hoards of acorns collected and buried by small mammals (the availability of acorns is critical to female boars as they need the extra nutrition for lactation) (Focardi Capizzi and Monetti 2000, in Wolf and Conover 2003). Pigs adapt their diet to best utilise local resources. In the semi-arid rangelands of eastern Australia and in New Guinea feral pigs will regularly hunt and devour lambs (particularly twin lambs (which are weaker) (Choquenot, Lukins and Curran 1997, in Wolf and Conover 2003; Hide 2003). On Horn Island, Mississippi, hogs take advantage of high seasonal abundances of insects, crabs and dead fish (Baron 1982, in Wolf and Conover 2003). On Santa Cruz Island, California, acorns and new growth of grasses and forbs are major components of the feral pig’s diet (Van Vuren 1984, in Wolf and Conover 2003). In South Carolina fruits, especially acorns are the most common food type consumed in fall and winter; herbage and foliage are most common in the spring; roots are most common in the summer. Invertebrates and vertebrates are also consumed, though they were not as important. The consumption of woody plants may be underestimated in stomach contents surveys as the starches and sap obtained from the roots of such plants go undetected (Wood and Roark 1980, in Wolf and Conover 2003). In the western South Texas Plains (introduced range) feral pigs have a spring-summer diet that consists mainly of vegetation, while acorns are their winter food source. Their autumn diet consists of roots and corn. Animal matter consisting of deer, morning doves, reptiles and other birds represents a small portion of the hog's diet. Of these, reptiles were the most susceptible to predation (Taylor and Hellgren 1997, in Wolf and Conover 2003). In one study conducted in Hawaii by Diong 1982, food habits were characterised by (1) an omnivorous diet consisting mainly of plant matter, (2) a staple of tree ferns, (3) a seasonal switch from tree ferns to strawberry guava, and (4) a strong reliance of earthworms as a source of animal protein. The dietary range covered 40 plant species (63% herbaceous species, 33% trees and woody vine). Tree ferns were the most concentrated source of sugar and starch. Expansion into new areas can result from transport for hunting, escape from confined facilities, dispersal of wild populations and escape of domestic swine from free ranging commercial ranches (Gipson Hlavachick And Berger 1998, in Wolf and Conover 2003).Released as food. Recommended citation: Global Invasive Species Database (2019) Species profile: Sus scrofa. Downloaded from http://www.iucngisd.org/gisd/speciesname/Sus+scrofa on 21-04-2019. Please follow this link for details on the general impacts of S. scrofa compiled by the ISSG. Much wisdom and insight can be gained from the case study of pig removal from Santiago Island in the Galapagos Archipelago (off the coast of Ecuador). Factors that proved critical to the successful eradication of the feral pig on the island were: (1) a sustained effort, (2) an effective poisoning campaign, (3) a hunting program, (4) access to animals by cutting more trails and, (5) an intensive monitoring program. Throughout the 1970s and 1980s, hunting effort was low (<500 hunter-days/year), while in the early 1990s effort increased but fluctuated. In contrast, the revised campaign in the mid-1990s resulted in a continuous, minimum annual effort of 1500 hunter-days/year. Hunter access to pigs was critical. Extra trails were cut and goats were not hunted in order to keep vegetation suppressed (allowing hunters and dogs access to all areas of the island). Motivating hunters was a continual challenge, especially when pigs were at low densities. However, social, moral boosting events and financial incentives maintained hunter motivation. While the poisoning campaign killed relatively few pigs compared to hunting, the low cost of the poisoning made such efforts especially cost-effective. The compounds used were toxic to most species, and thus the pros of using them for eradication had to be balanced with the potential impact on non-target species (Donlan et al., 2003a, in Cruz et al. 2005). In 2000, six months after the last pig was shot, the last pig was poisoned following an intensive monitoring effort. A sustained monitoring effort was critical to successful eradication. The lack of such an effort is responsible for many eradication failures (Campbell et al., 2004, in Cruz et al. 2005). Informations on Sus scrofa has been recorded for the following locations. Click on the name for additional informations. Anderson, S. J., Stone, C. P. 1993. Snaring to control feral pigs Sus scrofa in a remote Hawaiian rain forest. Biological Conservation 63: 195�201. Summary: This report reviews available information on the adverse effects of 14 alien vertebrates considered to be �significant invasive species on islands of the South Pacific and Hawaii, supplementing the authors� experience with that of other workers. Brown, Christopher E.; Pezeshki, S. Reza, 2000. A study on waterlogging as a potential tool to control Ligustrum sinense populations in western Tennessee. Wetlands. 20(3). September, 2000. 429-437. Dexter, N. 2003. Stochastic models of foot and mouth disease in feral pigs in the Australian semi-arid rangelandsJournal of Applied Ecology 40(2). Early Detection and Distribution Mapping System (EDDMapS), 2010. Chinese privet Ligustrum sinense Lour. Engeman, R.M., Smith, H.T., Severson, R., Severson, M.A., Woodland, J., Shwiff, A., Constantin, B. and Griffin, D. 2004. 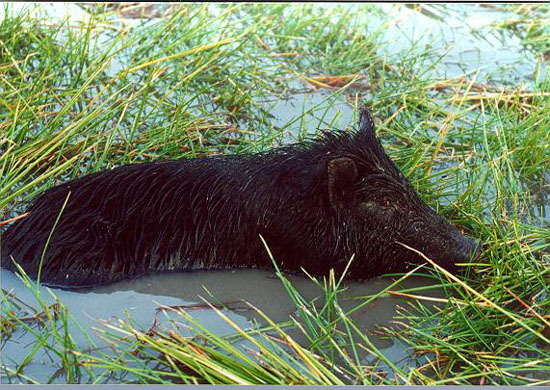 Damage Reduction Estimates and Benefit-cost Ratios for Feral Swine Control From the Last Remnant of a Basin Marsh System in Florida, Environmental Conservation 31 (3): 207-211. Greene, Brian T. and Bernd Blossey, August 5, 2009. COS 58-1: Patterns of privet: Why is the invasive plant Ligustrum sinense Lour associated with urban watersheds in the southeastern United States. Wednesday, August 5, 2009 - 8:00 AM. 94th ESA Annual Meeting Sunday August 2 -Friday, August 7 2009 Albuquerque, New Mexico. Hampton, J.O., Spencer, P.B.S., Alpers, D.L., Twigg, L.E, Woolnough, A.P., Doust, J., Higgs, T. and Pluske, J. 2004. Molecular techniques, wildlife management and the importance of genetic population structure and dispersal: a case study with feral pigs, Journal of Applied Ecology 41. Harrington, Timothy B.; Miller, James H., 2005. Effects of application rate, timing, and formulation of glyphosate and triclopyr on control of Chinese privet (Ligustrum sinense). Weed Technology. 19(1). JAN-MAR 2005. 47-54. Hide, R. 2003. Pig husbandry in New Guinea. A literature review and bibliography. Australian Centre for International Agricultural Research. Kessler, C.C., 2002. Eradication of feral goats and pigs and consequences for other biota on Sarigan Island, Commonwealth of the Northern Mariana Islands. In Turning the tide: the eradication of invasive species: 132-140. Veitch, C.R. and Clout, M.N.(eds). IUCN SSC Invasive Species Specialist Group. IUCN. Gland. Switzerland and Cambridge. UK. Marvin, David C.; Bradley, Bethany A.; Wilcove, David S., 2009. A Novel, Web-based, Ecosystem Mapping Tool Using Expert Opinion. Natural Areas Journal. 29(3). JUL 2009. 281-292. Matlack, Glenn R., 2002. Exotic plant species in Mississippi, USA: Critical issues in management and research. Natural Areas Journal. 22(3). July, 2002. 241-247. Mauremootoo, J. R.; C. G. Jones, W. A. Strahm, M. E. Dulloo, and Y. Mungroo., 2002. The effectiveness of weeded and fenced Conservation Management Areas as a means of maintaining the threateneed biodiversity of mainland Mauritius. In Turning the tide: the eradication of invasive species: 406 - 414. IUCN SSC Invasive Species Specialist Group. IUCN. Gland. Switzerland and Cambridge. UK. Montaldo, Norberto H., 1993. Avian dispersal and reproductive success of two species of Ligustrum (Oleaceae) in a subtropical forest relict in Argentina. Revista Chilena de Historia Natural. 66(1). 1993. 75-85. Moors, P. J., Atkinson, I. A. E. and Sherley, G. H. 1992. Reducing the rat threat to island birds. Bird Conservation International 2: 93�114. Patry, M. 2001. Feral Pig Eradication Campaign on Santiago Island, Galapagos. Informe Galapagos 2001. Fundaci�n Natura, Quito (in press). Summary: Describes the eradication project for pigs on Santiago Island, Galapagos. Covers the entire project from pre-1997 to May 2001. Queensland Pest Animal Strategy, 2004. Feral Pigs, The State of Queensland (Natural Resouces, Mines and Energy). Summary: The feral pig management strategy outlines the best practises for the management of feral pigs to minimise their impact on the environment, economy and health of Queensland. Schuyler, P. T., Garcelon, D. K. and Escover, S., 2002. Eradication of feral pigs (Sus scrofa) on Santa Catalina Island, California, USA. In Turning the tide: the eradication of invasive species: 274-286. Veitch, C.R. and Clout, M.N.(eds). IUCN SSC Invasive Species Specialist Group. IUCN. Gland. Switzerland and Cambridge. UK. Smith, K. E.; G. B Runion; S.A. Prior; A. J. Price; H. H. Rogers and H. A. Torbert, 2008. Chinese Privet (Ligustrum sinense) in an elevated CO2 Environment. Botany Research Journal 1 (2): 43-48, 2008. Thetford, Mack; Berry, James B., 2000. Response of five woody landscape plants to Primo and pruning. Journal of Environmental Horticulture. 18(3). September, 2000. 132-136. Twigg, L.E., Lowe, T., Martin, G. and Michael, E. 2005. Feral Pigs in North-western Australia: Basic Biology, Bait Consumption, and the Efficacy of 1080 Baits, Wildlife Research 32: 281-296. Vidra, Rebecca L.; Shear, Theodore H.; Stucky, Jon M., 2007. Effects of vegetation removal on native understory recovery in an exotic-rich urban forest. Journal of the Torrey Botanical Society. 134(3). JUL-SEP 2007. 410-419. Williams, Peter A.; Karl, Brian J.; Bannister, Peter; Lee, William G., 2000. Small mammals as potential seed dispersers in New Zealand. Austral Ecology. 25(5). October, 2000. 523-532. Wodzicki, K. A. 1950. Introduced mammals of New Zealand. Department of Scientific and Industrial Research Bulletin 98. Department of Scientific and Industrial Research, Wellington. Wolf, T. and Conover, M.R. 2003. Feral Pigs and the Environment: An Annotated Bibliography. Jack H. Berryman Institute 21: Utah State University, Logan; Mississippi State University, Starkville. Zavaleta, E.S., 2002. It s often better to eradicate, but can we eradicate better? In Turning the tide: the eradication of invasive species: 381-388. Veitch, C.R. and Clout, M.N.(eds). IUCN SSC Invasive Species Specialist Group. IUCN. Gland. Switzerland and Cambridge. UK. Zhang, Yan-Zhuo; Hanula, James L.; Sun, Jiang-Hua, 2008. Survey for potential insect biological control agents of Ligustrum sinense (Scrophulariales : Oleaceae) in China. Florida Entomologist. 91(3). SEP 2008. 372-382. Aplet, G. H., S. J. Anderson, and C. P. Stone. 1991. Association between feral pig disturbance and the composition of some alien plant assemblages in Hawaii Volcanos National Park. Vegetation 95:55-62. Auld, B. A. and Tisdell, C. A. 1986. In Groves, R. H. and Burdon, J. J. (eds.) Ecology of Biological Invasions: An Australian Perspective. Australian Academy of Science, Canberra. Summary: Personal communication with Fabien Barthelat, an expert of flora of Mayotte. Brescia, F. 2005. Am�lioration des connaissances sur l��cologie des bulimes (dynamique des populations, pr�dation), �tude des pr�l�vements dans les stocks naturels et poursuite du transfert de la m�thode d��levage sur l��le des Pins. Rapport d��tude IAC-DRN (Province Sud). Programme Elevage et Faune Sauvage IAC. Burton, Michele L.; Samuelson, Lisa J., 2008. Influence of urbanization on riparian forest diversity and structure in the Georgia Piedmont, US. Plant Ecology. 195(1). MAR 2008. 99-115. Burton, Michele L.; Samuelson, Lisa J.; Pan, Shufen, 2005. Riparian woody plant diversity and forest structure along an urban-rural gradient. Urban Ecosystems. 8(1). MAR 2005. 93-106. Cruz, J. B., and F. Cruz. 1996. Conservation of the dark-rumped petrel Pterodroma phaeopygia of the Galapagos Islands, 1982-1991. Bird Conservation International 6:23-32. Drake, Sara J.; Weltzin, Jake F.; Parr, Patricia D., 2003. Assessment of non-native invasive plant species on the United States Department of Energy Oak Ridge National Environmental Research Park. Castanea. 68(1). March 2003. 15-30. Griffen, J. 1977. Ecology of the feral pig on Hawaii Island. Elepaio 37: 140�142. Hook, T. and Todd, P. 1992. Mouse eradication on Mana Island. In Veitch, C. R., Fitzgerald, M., Innes, J. and Murphy, E. (eds) Proceedings of the national predator management workshop. Threatened Species Occasional Publication 3. Department of Conservation, Wellington. 33pp. Huenneke, L. F., and P. M. Vitousek. 1990. Seedling and clonal recruitment of the invasive tree Psidium cattleianum: Implications for management of native Hawaiian forests. Biological Conservation 53:199-212. Jaksic, F.M., Agust�n Iriarte, J., Jim�nez, J.E., and Mart�nez, D.R. 2002. Invaders without frontiers: cross-border invasions of exotic mammals Biological Invasions 4: 157-173. Kalesnik, Fabio; Acenolaza, Pablo, 2008. Regional distribution of native and exotic species in levees of the lower delta of the Parana river. Acta Scientiarum Biological Sciences. 30(4). OCT-DEC 2008. 391-402. Kirk, T. 1896. The displacement of species in New Zealand. Transactions of the New Zealand Institute 28: 1�27. Loewenstein, Nancy J.; Loewenstein, Edward F., 2005. Non-native plants in the understory of riparian forests across a land use gradient in the Southeast. Urban Ecosystems. 8(1). MAR 2005. 79-91. Louette M. 1999. La Faune terrestre de Mayotte - Mus�e Royal de l Afrique Centrale, 247 p.
McEwan, Ryan W.; Rieske, Lynne K.; Arthur, Mary A., 2009. Potential interactions between invasive woody shrubs and the gypsy moth (Lymantria dispar), an invasive insect herbivore. Biological Invasions. 11(4). APR 2009. 1053-1058. Merriam, Robert W., 2003. The abundance, distribution and edge associations of six non-indigenous, harmful plants across North Carolina. Journal of the Torrey Botanical Society. 130(4). October-December 2003. 283-291. Merriam, Robert W.; Feil, Elisabeth, 2002. The potential impact of an introduced shrub on native plant diversity and forest regeneration. Biological Invasions. 4(4). 2002. 369-373. Morris, Lorna L.; Walck, Jeffrey L.; Hidayati, Siti N., 2002. Growth and reproduction of the invasive Ligustrum sinense and native Forestiera ligustrina (Oleaceae): Implications for the invasion and persistence of a nonnative shrub.International Journal of Plant Sciences. 163(6). November 2002. 1001-1010. Osland, Michael J.; Pahl, James W.; Richardson, Curtis J., 2009. Native Bamboo [Arundinaria gigantea (Walter) Muhl., Poaceae] Establishment and Growth after the Removal of an Invasive Non-Native Shrub (Ligustrum sinense Lour., Oleaceae): Implications for Restoration. Castanea. 74(3). SEP 2009. 247-258. Probst J.-M. 1997. Animaux de la R�union. Azal�es Editions. 168 pp. Rudge, M. R. 1976. A note on the food of feral pigs (Sus scrofa) of Auckland Island. Proceedings of the New Zealand Ecological Society 23: 83�84. Spatz, G. and D. Mueller-Dombois. 1975. Succession patterns after pig digging in grassland communities on Mauna Loa, Hawaii. Phytocoecologia 3:346-373. Stone, C. P., L. W. Pratt, and J. T. Tunison. 1992. Responses of Hawaiian ecosystems to removal of feral pigs and goats. Pages 666-704 in C. P. Stone, C. W. Smith, and J. T. Tunison, editors. Alien plant invasions in native ecosystems of Hawai i: management and research. Cooperative National Park Resources Studies Unit. University of Hawaii at Manoa., Honolulu, HI. Stromayer, Karl A. K.; Warren, Robert J.; Harrington, Timothy B., 1998b. Managing Chinese privet for white-tailed deer. Southern Journal of Applied Forestry. 22(4). Nov., 1998. 227-230. Stromayer, Karl A. K.; Warren, Robert J.; Johnson, A. Sydney; Hale, Philip E.; Rogers, Carolyn L.; Tucker, Christopher L., 1998a. Chinese privet and the feeding ecology of white-tailed deer: The role of an exotic plant. Journal of Wildlife Management. 62(4). Oct., 1998. 1321-1329. Taylor, Constance E. S.; Magrath, Lawrence K.; Folley, Patricia; Buck, Paul; Carpenter, Sydney, 1996. Oklahoma vascular plants: Additions and distributional comments. Proceedings of the Oklahoma Academy of Science. 76(0). 1996. 31-34. Tisdell, C. A. 1982. Wild Pigs: Environmental Pest or Economic Resource? Pergamon Press, Sydney. USDA, ARS, 2010. Taxon: Ligustrum sinense Lour. National Genetic Resources Program. Germplasm Resources Information Network - (GRIN) [Online Database]. National Germplasm Resources Laboratory, Beltsville, Maryland. USDA, NRCS. 2010. Ligustrum sinense Lour. Chinese privet. The PLANTS Database (http://plants.usda.gov, 10 March 2010). National Plant Data Center, Baton Rouge, LA 70874-4490 USA. Wilcox, Joshua; Beck, Christopher W., 2007. Effects of Ligustrum sinense Lour. (Chinese privet) on abundance and diversity of songbirds and native plants in a southeastern nature preserve. Southeastern Naturalist. 6(3). 2007. 535-550.